Todd Rice never knew who his parents were; he was given up for adoption shortly after birth. In truth, he was the son of the Green Lantern Alan Scott and a woman named Rhosyn "Rose" Forrest. Rose suffered from mutiple personalities, the other being a destructive, selfish woman that called herself "Thorn". Her "Thorn" personality seemed to disappear after psychiatric treatment on Paradise Island, so she felt free to pursue Alan Scott, who she had fallen in love with. But her Thorn personality resurfaced and caused a fire that burned down the cabin the two had been staying in for their honeymoon. She later gave birth to twins; fearing that Thorn would return and hurt the children, she split them up and placed them in different orphanages. Todd was adopted by James and Shirley Rice. They had been trying to have children for some time, but had been unsuccessful, so they decided to turn to adoption. As it so turned out, unfortunately, the Rice family was far from the ideal family to adopt a child. Some time after the adoption, the pair managed to have a child of their own, Jeremy. Unfortunately, the burden of two children was a bit too much for James, who began to drink. And when he drank, he got violent. Eventually it became too much for Shirley, and she filed for divorce. Todd tried to convince her to stay, not for James, but for Jeremy, who was only about four at the time. Shirley took this as Todd "taking James's side", and when she left her husband, she took Jeremy but left Todd there. Todd had no choice but to stay, until he was eighteen. He was a troubled child, forever getting into fights at school, getting into trouble with the law — basically a delinquent. Not only that, though. One day while his father was passed out drunk and Todd was basically alone in the house, he realized that he could sort of… become his own shadow. He could become either a three-dimensional or two-dimensional shadow, float, move through objects as if he weren't "real", and a host of other things one would expect of a living shadow. It didn't do him much good in escaping his abusive father, though. But when he turned eighteen, he did something that WOULD help. He picked up and left in the night, getting as far away from Milwaukee as he could manage. New York City was where he ran out of land, so that's where he settled down. Kind of. Salvation Army shelters aren't exactly "settled down", but it's a start. FEED ON DARKNESS: Where there is evil or darker powers (necromancers, places where lots of death/bad happened, etc. ), Obsidian's powers function at a higher level than usual. He usually seeks out places like this, without realizing why they seem to be "calling" to him. 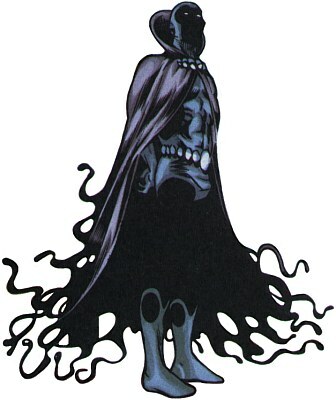 SHADOW BODY: Obsidian is linked to the Shadowlands, a dimension of quasi-sentient darkness, through his shadow. He can become a shadow, either three-dimensional or two dimensional. In this form (and only in this form) he is much stronger and faster than his human form, and can fly, pass through objects, and regenerate his body if damaged. His clothing and the items on his person also make this change. SHADOW CONSTRUCTS: Another effect of Obsidian's link to the Shadowlands is the ability to summon its substance through his shadow. He can make simple objects out of shadow, though since he generally prefers the direct route to solve problems, he's more familiar with melee weapons. SHADOW PORTALS: Obsidian can open portals to travel between two points in the range of a city. He cannot do this rapidfire, but he can draw other people or objects through, so long as he concentrates on keeping the portal open. SHADOW TELEPATHY: A very dark and not-nice form of telepathy, this ability does nothing but reach into a person's mind and try to pry loose a person's id, forcing it to the forefront. Someone so affected will do whatever their desires indicate, no matter how ill-advised or immoral it is. Stronger-willed individuals may merely find themselves plagued by thoughts of their darker, baser urges. He cannot turn someone evil, however; this cannot make someone do something they don't already want to do, somewhere, even if it's buried deep down. People without darkness in their hearts (if there is such a person), as well as people who are wholly evil or have no morals, are unaffected by this. HAND-EYE COORDINATION: Todd's hand-eye coordination is fantastic. It's such that he can juggle dangerous things with minimal risk to his own personal safety. Mind you, he has no reason to juggle dangerous things. But he can if he took a notion to. MATHEMATICS: Todd has a head for numbers, and a talent for maths. He is a poorly-educated high school student, though, so he'd better get some tutoring in this before tries to do anything with it. SPATIAL AWARENESS: Todd is usually very aware of where he is in physical space, thanks in no small part to his ability to change into a shadow. This means he is able to dodge attacks much better than the average person. Though he still has to be able to move fast enough. MATH SCHOLARSHIP: Todd's head for numbers has allowed him to get a math scholarship at a local college, giving him a decent chance at an education, a place to sleep, as well as a daytime "cover" for his heroing activities. This plus a part time job as a math tutor in a local high school leaves him with a passable, if not a luxurious standard of living. TROUBLED: Let it be said first that, despite all his problems, Todd IS a good person. He cares enough about his fellow man that he would want to use his powers for the betterment of all. He's just young and impulsive, and doesn't really know where to focus them. He's quiet and doesn't seem to really know how to socialize all that well, and that could lead people to believe he doesn't care. He isn't anti-social, he just doesn't "people" super well. He doesn't say a lot usually, though there are exceptions, and when he does talk, it tends to be in as few words as possible. SCHIZOPHRENIA: He also isn't exactly the kind that will go out clubbing a whole lot. He can more or less function in society, but not super-well. He has, unfortunately, inherited his mother's mental problems — her schizophrenia, not her multiple personalities (thankfully). At times he may suffer from any of the following: he may have trouble expressing his emotions, he generally speaks little, doesn't usually feel any pressing need to make new friends or keep current friends around him, and sometimes has trouble getting the motivation to do things. TEMPER: He also has a temper, and is also prone to violent outbursts when that temper flares. While his temper may be something he just has to deal with, the violent outbursts may be learned behavior, and as such could be a habit that can be broken. There is, however, a tremendous amount of rage inside him, and it boils close to the surface at all times. KINDNESS: It would be incorrect to say that his childhood taught him nothing but bad habits. While he may have learned that dealing with anger always involves violence, he also knows what it feels like to be on the receiving end of that violence. So he's going to make certain not to put anyone on the other end of his violence that he doesn't feel deserves it. Criminals, people who would prey on the innocent — those kinds of people. IMPULSIVE: He's likely to turn to vigilantism partly to help other people and partly because his rage needs a victim. Beating up people that are already reprehensible seems like a good way to get the aggression out. Mind you, he hasn't (and probably won't) consider the consequences of this sort of behavior, whether it's illegal, etc. And he's not likely to let himself think about the fact that those people have families, or that he's so much stronger than they are, particularly in his shadow form. This is a really bad combination. RECKLESS: Add to this that Todd's quite reckless and tends to not think about the consequences of ANY action. He really IS a good guy, and he tries hard to do the right thing, but he is impulsive by nature and tends to just "go with it" if a decision seems like a good idea at the time. Without guidance, Todd's recklessness and penchant for leaping into action first and asking questions later is going to get him in serious trouble, even if he's trying to help. LIGHT VULNERABILITY: Being that his shadow form is… well, SHADOWS, Obsidian takes more damage from offensive light sources. Lasers are especially damaging to his shadow form. MOODY: Obsidian's life hasn't been the best, so he's really not sure how to be "happy". He's prone to unpredictable moods, and bouts of gloominess. It's bound to make him hard to get along with. SEEING YOUR DARKNESS: Because of his mild telepathic abilities, Todd is often plagued by others' thoughts. However, because his powers have a significantly darker slant than normal, all he sees is the bad in people — their bad emotions, their unpleasant memories, etc. It makes it hard to trust, since he can't equally see the good in people's hearts. SCHIZOPHRENIA: Todd suffers from schizophrenia, and manifests a large number of the classic symptoms of it. It leaves him impulsive and more prone to be violent, and interferes with his ability to function in society, not to mention his ability and desire to make personal relationships.